Smith was born in Inverness on 24 August 1962 to Ann and Donald Smith. Her parents were working-class and she was raised in a council house in Inverness. From 1967 to 1974 she attended St. Joseph's RC Primary school, then went on to Inverness High School, leaving in 1980. She studied a joint degree in English language and literature at the University of Aberdeen from 1980 to 1985, coming first in her class in 1982 and gaining a top first in Senior Honours English in 1984. She won the University's Bobby Aitken Memorial Prize for poetry in 1984. From 1985 to 1990 she attended Newnham College, Cambridge studying for a PhD in American and Irish modernism. During her time at Cambridge, she began writing plays and as a result did not complete her doctorate. Smith moved to Edinburgh from Cambridge in 1990 and worked as a lecturer of Scottish, English and American literature at the University of Strathclyde. She left the University in 1992 because she was suffering from chronic fatigue syndrome. She returned to Cambridge to recuperate. As a young woman, Smith held several part-time jobs including a waitress, lettuce-cleaner, tourist board assistant, receptionist at BBC Highland and advertising copywriter. While studying for her PhD at Cambridge Smith wrote several plays which were staged at the Edinburgh Festival Fringe and Cambridge Footlights. After some time working in Scotland, she returned to Cambridge to concentrate on her writing, in particular, focussing on short stories and freelancing as the fiction reviewer for The Scotsman newspaper. In 1995 she published her first book, Free Love and Other Stories, a collection of 12 short stories which won the Saltire First Book of the Year award and Scottish Arts Council Book Award. She writes articles for The Guardian, The Scotsman, New Statesman and the Times Literary Supplement. Free Love and Other Stories (1995), awarded the Saltire First Book of the Year award and Scottish Arts Council Book Award. Hotel World (2001), awarded the Encore Award, a Scottish Arts Council Book Award and the inaugural Scottish Arts Council Book of the Year Award. Shortlisted for the Orange Prize for Fiction and the Man Booker Prize for Fiction. Girl Meets Boy (2007), winner of Diva magazine readers’ choice Book of the Year, Sundial Scottish Arts Council Novel of the Year. There But For The (2011), cited by the Guardian book review as one of the best novels of the year. Artful (2012), shortlisted for the inaugural Goldsmiths Prize (2013). How to Be Both (2014), shortlisted for the 2014 Man Booker Prize, the 2015 Baileys Women's Prize for Fiction (winner), and the Folio Prize. It was the winner of the 2014 Goldsmiths Prize and of the Novel Award in the 2014 Costa Book Awards. Autumn (2016), shortlisted for the 2017 Man Booker Prize. Shire (2013), with images by Sarah Wood: short stories and autobiographical writing. Full Circle Editions. Ali Smith partnered with the Scottish band Trashcan Sinatras and wrote the lyrics to a song called "Half An Apple", a love song about keeping half an apple spare for a loved one who is gone. The song was released on 5 March 2007, on the album Ballads of the Book. In 2008 Ali Smith produced The Book Lover a collection of her favourite writing including pieces from Sylvia Plath, Muriel Spark, Grace Paley, and Margaret Atwood. It also includes work from lesser known writers like Joseph Roth and Clarice Lispector. In 2008 she contributed a short story "Writ" to an anthology supporting Save the Children. The anthology is entitled "The Children's Hours" and was published by Arcadia Books. Foreign editions have been published in Portugal, Italy, China and Korea. In 2011 she wrote a short memoir for The Observer in their "Once upon a life" series: 'Looking back on her life, writer Ali Smith returns to the moment of conception to weave a poignant and funny memoir of an irreverent father, a weakness for Greek musicals and a fateful border crossing'. In October 2012, she read a sermon at Manchester Cathedral to guests and students, followed by a book signing. On 14 May 2013 Ali Smith gave the inaugural Harriet Martineau lecture, in celebration of Norwich, UNESCO's 2012 City of Literature. Ali Smith is also a patron of the Visual Verse online anthology and her piece Untitled, written in response to an image by artist Rupert Jessop, appears in the November 2014 edition. On 10 September 2015 Ali Smith was nominated Honorary Fellow by Goldsmiths, University of London. In 2011 she contributed a short story "Why Holly Berries are as Red as Roses" to an anthology supporting The Woodland Trust. The anthology - Why Willows Weep - has so far helped The Woodland Trust plant approximately 50,000 trees, and is to be re-released in paperback format in 2016. In July 2016, Smith was awarded an honorary doctorate from the University of East Anglia. Smith was appointed Commander of the Order of the British Empire (CBE) in the 2015 New Year Honours for services to literature. ^ "Ali Smith". Contemporary Writers in the UK. The British Council. Archived from the original on 16 July 2009. Retrieved 2009-02-27. ^ a b Matthews, Elizabeth (30 March 2007). "Novel approach struck a chord with Inverness writer". The Inverness Courier. Archived from the original on 27 September 2007. Retrieved 2009-02-27. ^ a b c d e f g h i j k Ali Smith: Contemporary Critical Perspectives. London: Bloomsbury. 2013. ISBN 978-1-4411-5990-8. ^ a b c d e "Smith, Ali 1962–". www.encyclopedia.com. Retrieved 2016-11-19. ^ Germanà, Monica; Horton, Emily (2013-07-18). Ali Smith: Contemporary Critical Perspectives. A&C Black. ISBN 9781441181558. ^ a b "Ali Smith - Honorary Award Holders, Anglia Ruskin University". www.anglia.ac.uk. Retrieved 2016-11-19. ^ a b "Ali Smith". guardian.co.uk. Guardian News and Media Limited. 22 July 2008. Retrieved 2009-02-27. ^ "The First Person and Other Stories by Ali Smith". The Short Review. Retrieved 2016-11-11. ^ a b c d e "Ali Smith". Contemporary Writers in the UK. The British Council. Archived from the original on 16 July 2009. Retrieved 2009-02-27. ^ Guest, Katy (3 October 2008). "The First Person and Other Stories, By Ali Smith". The Independent. Archived from the original on 18 April 2009. Retrieved 23 April 2009. ^ "Girl Meets Boy wins Diva Book Of The Year". The Myths. 17 April 2014. Archived from the original on 3 January 2011. Retrieved 11 November 2016. ^ "Sundial Scottish Arts Council Book of the Year". Scottish Arts Council. Retrieved 2009-02-27. ^ "Books of the year 2011 | Books". The Guardian. Retrieved 2016-11-11. ^ "Jim Crace makes Goldsmiths Prize shortlist". BBC news. 1 October 2013. Retrieved 20 October 2013. ^ "Shortlist 2013". Goldsmiths Prize. 1 October 2013. Archived from the original on 5 October 2013. Retrieved 20 October 2013. ^ "New Statesman | The shortlist for the 2014 Goldsmiths Prize has been announced". New Statesman. 1 October 2014. Retrieved 2 October 2014. ^ "Man Booker prize 2017: shortlist makes room for debuts alongside big names". The Guardian. 13 September 2017. Retrieved 20 October 2017. ^ a b "Ali Smith". Doollee.com. 2014-04-24. Retrieved 2016-11-11. ^ Ali Smith. "Once upon a life: Ali Smith | Life and style". The Guardian. Retrieved 2016-11-11. ^ "The Manchester Sermon: Ali Smith, reviewed by Gemma Fairclough - The Manchester Review". The Manchester Review. 2012-10-19. Retrieved 2018-02-02. ^ Full text: "Brick: a literary journal" (Number 92, Winter 2014, pp. 9–27); extract online at Brickmag.com. ^ "Untitled by Ali Smith". Visualverse.org. Retrieved 24 November 2014. ^ Cox, Sarah. 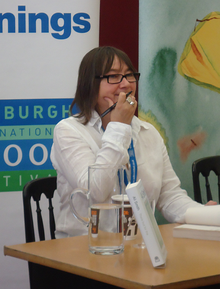 "Novelist Ali Smith named Honorary Fellow". Goldsmiths, University of London. Retrieved 2018-02-02. ^ "Day 1 - Ali Smith - UEA". www.uea.ac.uk. Retrieved 2017-05-03. ^ Winterson, Jeanette (25 April 2003). "Ali Smith". The Times. Retrieved 2009-02-28. ^ "Order of the Companions of Honour : Members of the Order of the Companions of Honour" (PDF). Gov.uk. Archived from the original (PDF) on 2 January 2015. Retrieved 2016-11-11.